Palm’s stock soared today (up 13% as of this writing) on the news that due to very strong demand for a previously announced public offering of common stock the company has increased the size of the offering to 23.125 million shares – priced at $6 per share – from which Palm will receive net proceeds of approximately $83.9 million. Additionally, the underwriters of this public offering (Morgan Stanley) will also have a 30 day option to purchase approximately 3.5 million additional shares of common stock from Palm to cover any over-allotments – from which Palm would receive additional net proceed of approximately $21.0 million. Perhaps not coincidentally, news of this public offering comes closely behind comments made by Palm investor Roger McNamee (founding partner of Elevation Partners which now owns some 39% of Palm) last Friday which caused quite a stir – particularly among Apple fans (see also Palm Pre vs. iPhone Comparison). Listen, let me just start with the fact that you say the battle is not between Apple’s iPhone and Research in Motion’s Blackberry but between Motorola and the other smart phones. Why is that? People typically think of Palm as a rival to Blackberry. They’re right to think of it as a rival, but the most important change that’s taking place, particularly if you’re an investor or a customer, is that we’re going from what are known as feature phones, the old 12-key phones that just make phone calls and send texts, to smart phones. The reason is because the cost of a smart phone has come down so much that the premium is tiny. People realize that if they want, they can get a device that’s fantastic for corporate e-mail (that would be a Blackberry) or a device that’s fantastic for playing music or playing games (that would be an iPhone) or, knock wood, they’ll be just as excited about the Pre, and that would be if you’re a person who’s really focused on the web or you’re really busy. What I think you’re going to see is a very rapid market share shift away from simple phones to these much more capable smart phones. In the US, smart phones went from 10% to 20% just in the last year. We would anticipate that they would be 50% within 5 years. This is a huge market: 1.2 billion units sold per year. When people sit there and talk about Apple versus Blackberry, what they forget: Blackberry’s global market share is about 1.2%, and Apple’s is about 0.9 of 1%. They aren’t really fighting each other; they’re really fighting folks like Motorola, Samsung, LG, Nokia, the people who make the old-fashioned phones. By the way, and many more! I actually expect you’ll see new entrants as well. I wonder though, you’ve got to hone in on the iPhone. Blackberry clearly is aimed at corporate customers, but the iPhone is a web tool as well as a music player. It’s interesting that your company, Elevation Partners, was co-founded also by Bono of U2. Of course, this company is so closely linked, at least in the public image, with Apple. Well, and also, remember, my partner Fred Anderson used to be the Chief Financial Officer at Apple. We’re very big fans of Apple. I’ve been an Apple customer continuously since 1986. wouldn’t use any other kind of computer. I have an iPhone. I have an iPod Touch and lots of other iPods. They make great products. For media, they’re fantastic, but our product, the Palm Pre—and again, I’m a board member of Palm; we’re a huge investor in the company, just so people understand the conflicts here—but our product [Palm Pre] is just going to run rings around them [iPhone] on the web. If you want to go to the web, it’s just going to be a million times—well, not a million times—several times faster. That’s a huge deal for most people. What is your target audience? Are you looking at a new generation of smart phone users, maybe the younger kids, or are you looking at a different kind of job element? Where’s the Pre aimed? Actually, I would tell you, I don’t know who’s going to buy it. When I say that, it’s because phones are very personal. You know, how people really identify with their cars, increasingly they identify with their phones as well. There are aspects of the Pre that are unlike any phone you’ve ever seen before. If you look at the iPhone or if you look at Blackberry, you look at Microsoft Windows mobile device or even the Google phone, they’re all based on personal computer technology. The Pre is the first one that is the next generation. The result is it does a lot of things the other guys don’t do. We think that women are going to find it particularly attractive, and we think people who want the latest technology are going to find it particularly attractive, and anybody who’s incredibly busy. It’s really aimed at people who are busy, because part of this redesign is getting you away from the personal computer model where you have to—if you want something to happen, you have to direct it. This product’s going to do a lot of automation, and it’s going to appear to think for you. I think people who are busier are going to find that really appealing. Speaking of women, Roger, I have a question for you. As part of your due diligence before you invested in Palm, do you think the Pre is going to have a problem? Why should investors be concerned or even buyers of the Pre be worried about having connection problems similar to what we saw with Apple when it debuted iPhone? That’s actually a fantastic question. The issue with third generation networks, the so-called ‘3G’ networks, is that technically they’re very difficult to maintain. They are digital, and as a consequence, the beam, if it’s interrupted for even a moment, drops the call. What happens is that as these 3G networks first go in place, dropped calls are a huge problem. The more mature your network, the more stable it is. Sprint, which is our partner, has by far the most mature 3G network. They started before anyone else. AT&T’s is brand new. It’s not that AT&T’s a lousy network provider; it’s that their stuff is just—it’s new, and it’s going to take a few years to get the kinks out. It doesn’t matter whether you’re using an iPhone or any other 3G device on the AT&T network. It’s just less stable. Verizon is relatively much more stable, and Sprint more stable than that. If you’re using 3G, you’re just going to be happier on Sprint or on Verizon than you are on AT&T, but that won’t be forever. AT&T will fix it. 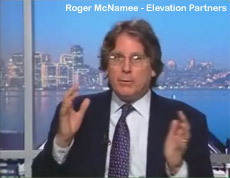 McNamee’s bravado during the TV interview above proved so strong that Palm actually had to issue a “clarification & corrections” note stating that “the interview and article published by Bloomberg were not prepared by or reviewed by Palm prior to their broadcasting and publication”. Although market share estimates such as those in the fourth paragraph of the transcript that “Blackberry’s global market share is about 1.2%, and Apple’s is about 0.9 of 1%” are, by their nature, approximations, one third party industry analyst report indicates that in 2007 and 2008, Blackberry’s share of worldwide mobile phone shipments was 1.1% and 1.9%, respectively, and Apple’s was 0.3% and 1.2%, respectively. With respect to the statement in the fourth paragraph of the transcript that “in the US, smart phones went from 10% to 20% just in the last year,” one third party industry analyst report indicates that smart phones made up 11.1% of U.S. mobile phone shipments in 2007 and 19.5% in 2008. With respect to the statement in the fourth paragraph of the transcript that smartphones are anticipated to increase their share of the U.S. mobile phone market to “50% within 5 years,” one third party industry analyst report estimates smartphone share of the U.S. mobile phone market will reach 42.0% in 2012. With respect to the statement in the fourth paragraph of the transcript that “this is a huge market: 1.2 billion units sold per year,” one third party industry analyst report estimates worldwide mobile phone shipments exceeded 1.2 billion in 2008. With respect to the statements in the tenth paragraph of the transcript that the Palm Pre is “going to be a million times – well, not a million times – several times faster” than Apple, Inc.’s iPhone products and is “going to run rings around them on the web,” the Palm Pre is still under development and it is premature to state the speed at which the device accesses the web or the relative speed of the Palm Pre compared to the smartphone products of competitors. With respect to the statements in the twelfth paragraph of the transcript that “there are aspects of the Pre that are unlike any phone you’ve every seen before,” “the Pre is the first one that is the next generation” and “the result is it does a lot of things the others guys don’t do,” the Palm Pre is designed to be the first phone based on the Palm webOS™ platform and as a result will have different operating characteristics and features than other phones, however; the Palm Pre is still under development and it is premature to compare its full functionality with that of other phones. The statements in the fourteenth paragraph of the transcript regarding the relative development and stability of Sprint’s, Verizon’s and AT&T’s 3G networks are generalizations regarding wireless cellular network performance that may or may not be true depending on a variety of factors specific to geographic regions . With respect to the statements in the second to last paragraph of the article that “the underlying technology for Research In Motion Ltd.’s BlackBerry is about 13 years old, while the technology behind the iPhone goes back almost nine years,” estimating one specific age for the many technology components underlying any mobile phone is inherently imprecise and these statements are withdrawn. With respect to the implications in the second to last and last paragraphs of the article that Palm’s new operating system will give it an edge over competitors that “are going to run out of gas way before” Palm, estimations of the relative useful lifespan of smartphone operating systems are conjecture, unverifiable at this time, and age is not necessarily predictive of their relative long-term success. Our company just banned any more iPhones from accessing our Exchange server since they can't be encrypted (at least for now). Interesting....glad I bought the Pro! I was in my local Sprint store the other night and the salesperson allowed me to handle a Treo Pro that they have in the back room of the store. I must say, I can better understand Andrew's enthusiasm over the Pro. I've owned the 700p, and still own the Centro and Treo 800w. Of all of these, this Treo Pro has the most quality feel to its build. It just feels solid, while maintaining a very attractive design factor. I like the keys on the 800w a bit better, but otherwise that Pro is sweet. I hope Palm can do well with the Pre as well, and that they put the same solid construction efforts into it as they obviously have with the Pro. That all sounds great, but time is the matter. Now everything with the Pre and WebOS sounds great, but how long does HTC oder Apple need to copy that and upgrade their existing phones? I agree, Palm might be blowing it with the wait. The next gen Iphone will soon be here and you can bet they're gonna bring the funk. The G2 is coming up also. It's crazy, the Pre is already starting to feel dated. I'm going to get one though. I just hope Palm can meet the metrics of a strong launch and a not too long a wait. It's funny to hear Mr. McNamee talk about stability and maturity in the context of AT&T's 3G network, while totally glossing over the stability and maturity of the product he's pushing. The Pre's WebOS will be a version 1.0 product. Everyone knows what that means -- there will be countless glitches, some large, some small. Realistically you've gotta assume that for the first year or so, new Pre owners will need an above-average amount of patience until those glitches are worked out. What a circus act. Watching Palm itself having to scramble to release a "reality check" on the hyperbole from the MD of its primary investor is surreal. A "PRE-cursor" to disaster, I'm afraid. Q: How do you make a small fortune? Is Palm working for Bernie Madoff? Here's the SEC filing and some commentary. The trouble with Apple is that they are so full of themselves, they won't make the major changes they need to make. They pioneered "cool" for a phone, so why should they deviate from a successful model? Removable battery? Only at gunpoint! Sliding keyboard? It doesn't come into question! Better durability? Never at the expense of our impeccable form factor! Apple's hubris will be its undoing. As chip prices and computer sales plummet, they'll never be able to keep up their profit margin on their overpriced machines. Sure, they're outstanding machines, but still overpriced based on hype and smug loyalty.